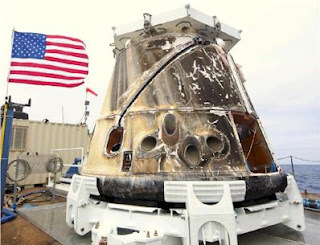 The flawless launch, docking and landing of Space X's Dragon capsule not only validates their cargo delivery system and the Falcon 9 rocket, but it also advances the more urgent goal of preparing for manned Dragon launches. Any difficulties with this demonstration mission would have set back the timetable for completing the manned capsule. Space X CEO Elon Musk told Coalition Director Art Harman last summer he expects to launch the first manned mission in "two to three years." Ending the complete reliance upon Soyuz is essential to the survival of ISS, as another Soyuz launch failure could result in its temporary or long-term decrewing; a topic the Coalition has investigated (see The Three Solutions to Save ISS From Evacuation). The Coalition offers the highest possible congratulations to Elon Musk and Space X, and continues to urge they follow Mr. Musk's "two to three years" target--which would now be one to two years--and make even greater history with the first commercial orbital manned launch in 2013 or 2014.